If you don’t know what a squash bug or stink bug or squash vine borer is count yourself lucky and skip this post and click here for Spy Garden pictures from today! I had a “volunteer” cantaloupe come up this year. It was healthy and producing however every melon (at various stages of development) got borers in them and were ruined. 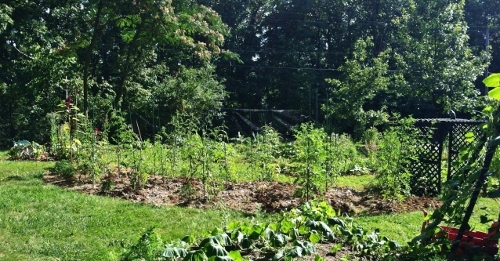 I garden organically so I was at a loss as to what to use – tried Insecticidal soap but it didn’t help. Do you get borers (aka: squash borers – but they seem to like cukes, melons and squash)? If so do you use anything to get rid of them? Thanks – I’m trying to figure out how to avoid this next summer. We have definitely had struggles with squash bugs in Spy Garden. And, like WryGrass, we do not use any chemicals or insecticides. I don’t even use the “organic” sprays because I feel that the garden is so big there is no way I could rely on spray bottles for pest control! 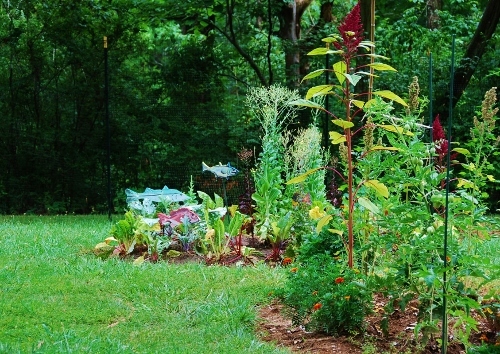 It would cost a fortune and it is so time-consuming to spray the plants (especially if it is raining a lot). I have found that most sprays don’t even work anyways. I absolutely hate squash bugs so I feel your pain. I don’t think you can ever really conquer any garden pest. Every year is different and what seems to work one year may fail the next year. But the following are the things I’ve implemented to combat those wretched bugs and can help you plan for the 2014 Squash Bug Offensive! 1. 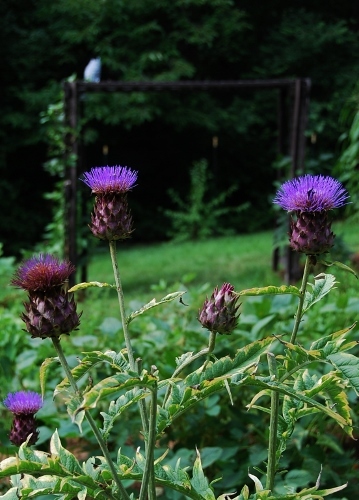 Plant a lot of flowering plants that attract bees. Borage, bee balm and catnip attract LOADS of bees to our garden. 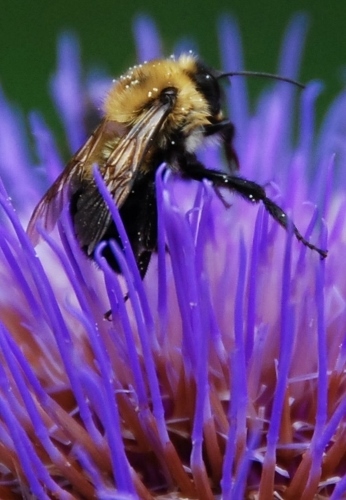 I’ve noticed more bees than ever before in our garden this year and less squash bugs. As a general rule, the more predators and pollinators you have, the less pests! So whatever you can do to attract frogs, toads, spiders, birds and bats are also bonuses. 2. Plant flowering plants and herbs right alongside your vegetables. Thyme, mint, oregano, rosemary, dill. As many fragrant herbs as you can. Also plant lots of marigolds and nasturtiums, both of those are naturally repellant to many pests. And garlic, lots and lots of garlic! I used my extra scapes in lieu of using garlic sprays. 2. 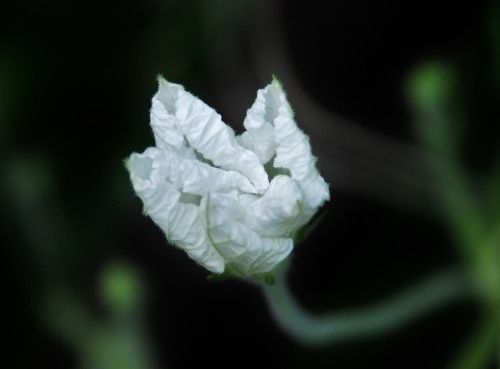 Plant cucurbits (squash, melons and cucumbers are all related and all susceptible to squash bugs) as late in the season as possible. Squash bugs around here start laying eggs during the first part of spring. I waited a long time to plant anything this year (about May 15). I remember seeing (and squishing!) squash bugs eggs a few weeks before any cucurbits went in the ground. 4. 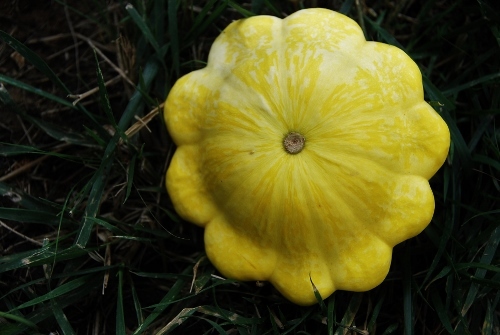 Limit the number of squash or whatever cucurbits are most susceptible for you. Last year I had a dozen squash plants and all but one were destroyed by squash bugs. It is better to have one healthy plant than a dozen withered ones! 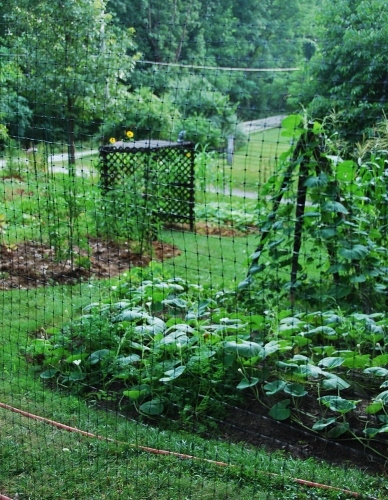 Also, rotate your crops and try not to plant the same things in the same spot every year. 5. Look for resistant varieties. Lemon squash is a summer squash variety that is resistant. And last year, for me at least, upper ground sweet potato was an amazingly resilient winter squash. One plant was attacked by squash bugs and eaten nearly to a nub by deer and the plant still made a comeback and produced one nice sized pumpkin. 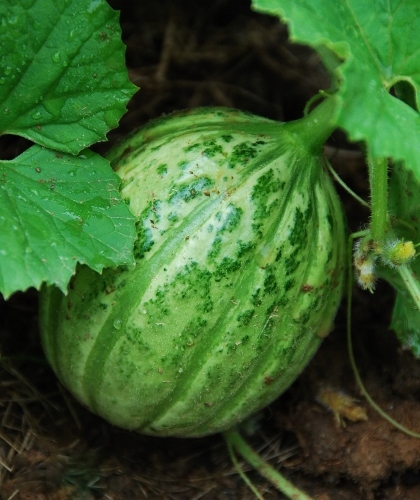 You could also look for resistant cucumber and melon varieties. 6. If squash bugs do appear I would suggest destroying all but a few of the plants and handpicking them daily and try to keep the plants alive (in the past I have never been able to keep up with this and just had to say farewell). I knew someone who used regular dish soap and water in a large sprayer and would spray them (which slows them down) and then handpicked them one by one and dumped them in a bucket). That is a bit too labor-intensive for me, but it did work for her. 7. I just re-read WryGrass’ question and realized she wrote Squash Vine Borer not Squash Bug. They are often referred to by the same name (also “Stink Bug”) They all three different bugs, but basically cause the same problems. However, some additional tips for the borers are to protect the stems (you could also wrap the fruits) with nylon stockings to prevent them from burrowing in. 8. I have seen squash bugs in the garden this year. The eggs I mentioned, plus one adult on the scallop squash and quite a few in my strawberry and artichoke row. I immediately kill the ones I see (disposable latex or vinyl gloves are the perfect gardening gloves, especially for bug squishing!) I’ve seen them quite often on the artichokes. Just nestled in the folds of the artichokes doing nothing. They didn’t do any damage to the artichokes or the strawberries. So you could try planting those two things as trap crops. I’ve also heard of radishes being a trap crop for squash bugs but have never found that to be true in practice. 9. Destroy their winter habitat. Make sure all the plants and clippings and stuff are burned or completely disposed of. I’ve also heard of limiting mulching. We don’t mulch the garden beds when things are growing. However, the past few years I’ve piled all the fall leaves on top of my garden beds which would, in theory, be creating the perfect winter habitat for pests. But I feel the piles of leaves provides good insulation for the overwintering plants and adds to the soil so I do it anyway. But in the spring, I work all the decomposed leaves into the soil so there are not many places for them to hide once planting begins. 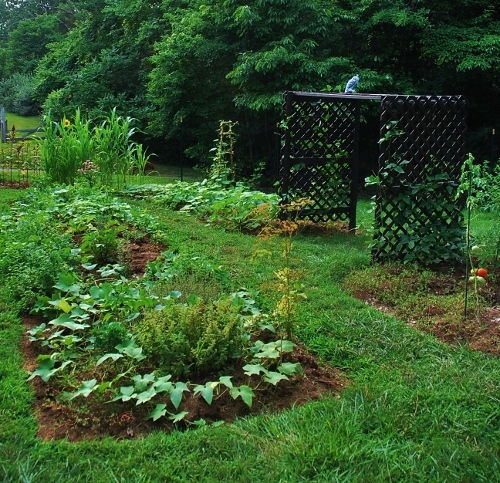 If you do mulch your garden during the growing season (and have squash bug problems) you could try changing that up. All of these tips don’t just work for squash bugs, but pretty much apply to all garden insect pests. My motto is to grow as many things as possible that way when one plant is disappointing you (as my tomatoes and sunflowers are this year), one is surprising and delighting you! 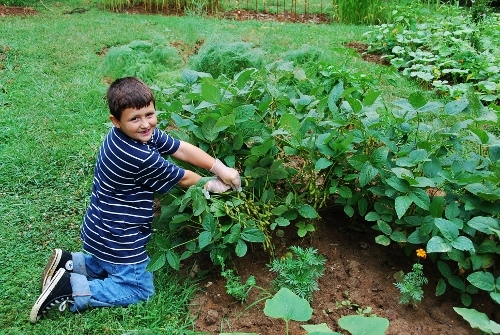 This entry was posted in Gardening, Glogging, Squash Bug prevention on July 31, 2013 by Spy Garden. The spy helping to harvest soy beans! 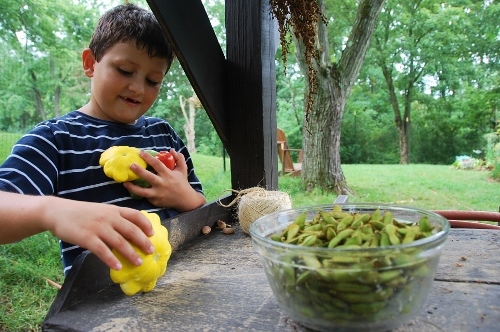 This is our first time growing soy beans. The variety is Envy Soya Beans (from Baker Creek). They were SUPER easy to grow. 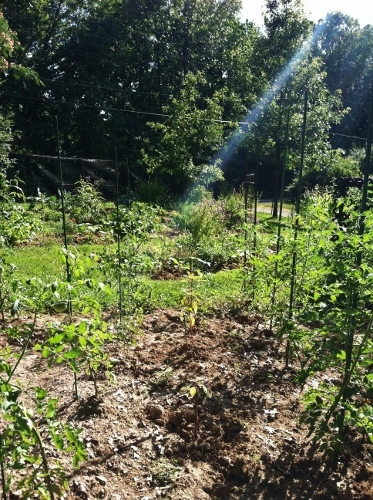 They did attract Japanese beetles which only did minor damage to the foliage, not the beans. Check out the big bowl of soy beans! That is only about a fifth of what is still on the plants. Also in the photo, the spy is holding some German lunchbox tomatoes and some patisson golden marbre scallop squash. Some are solid yellow and some are slightly variagated white/yellow. They are not golden (as advertised) but still very pretty! 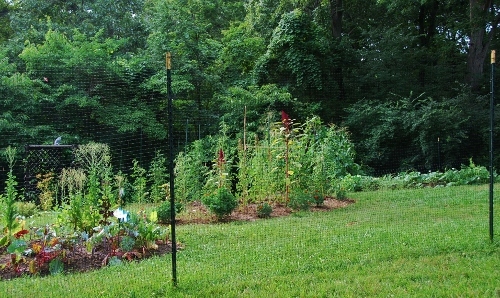 This entry was posted in Art, Deer fence, DIY, Fishing, Food, Garden Teepee, Gardening, Glogging, Humor, Kids, Missouri, Painting, Parenting, Photography, St. Louis on July 31, 2013 by Spy Garden. I really shouldn’t be calling these woes (it could certainly be worse)…But it sounded good with “taymose” which is how the baby (she’s nearly two but I can’t seem to stop referring to her as “the baby”) pronounces “tomatoes”. Look mommy! Here’s one that is not ripe. We have lost equal amounts of tomatoes this season to the Baby Tomato Caper as we have to blossom end rot (maybe a dozen fruits to each). 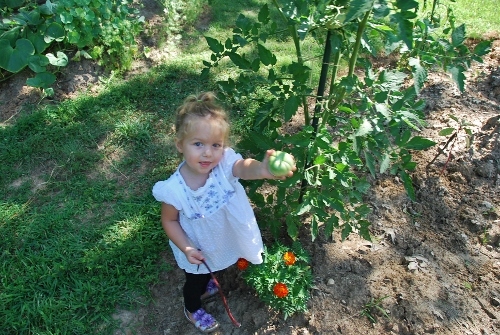 But, I ate my first two ripe tomatoes today! One yellow sun cherry (which I shared with the Chief Taymose Picker) and an orange icicle that I ate with romaine, spinach, sweet potato and hot sauce on pumpernickel bread. It was all so exciting (hahaha) I neglected to get pictures of either. Both tomatoes were bursting with freshness and sweet and tart and worth the eyesore they are in the garden. Maybe eyesore is a bit harsh. I am going to plant them down in the back nine. Where the sorghum and cucumber obelisk grows now. Also I am going to think harder about the number of plants. I’m thinking 17 or 19. Because I like odd numbers and because 25 is a few too many. I like having multiple varieties (we have 7 now), but tomato plants are kind of high-maintenance. Suckering, tying them up, plus the plants stink and leave a residue on your hands that is hard to scrub out if you’ve spent awhile wrangling them. In the meantime, I will continue to guide “the baby” to picking the little yellow “starbees” (strawberries) instead of the green “taymose” and hope for more vine-ripened goodness soon! This entry was posted in DIY, Food, Gardening, Glogging, Humor, Kids, Missouri, Parenting, Photography, St. Louis on July 30, 2013 by Spy Garden.